Century Bank offers the following: sweep accounts, payroll direct deposit, wire transfers, gift cards, safe deposit boxes, night depository, remote capture, and business banking. Century Bank offers online banking for all of our accounts, giving our customers the ease and flexibility to access their account information anytime, anywhere! Just call toll-free (888) 559-9274 to reach our automated telephone banking system. You can check your balance, find out if a check has come through, if a deposit has been made, or transfer money from one account to another. It is so easy! To find out more or if you have any questions, please call us at (712) 246-2205. ATM Cards are available to Century Bank customers. They enable customers to get cash and make deposits during or after banking hours. Debit Cards offer the convenience of checking, plus the added value of safety, easy record keeping and affordability. The amount of the purchase is deducted from your checking account balance. If you lose your card, please call the Bank immediately at (712) 246-2205. If the Bank is not open, please call 1-800-383-8000. If you would like to activate your debit card or personalize your PIN, please have your card ready and call (800) 717-4923. Calls must come from a phone number on record with Shazam. If you are unsure about the phone number on record, please call the Bank at (712) 246-2205 during normal business hours. 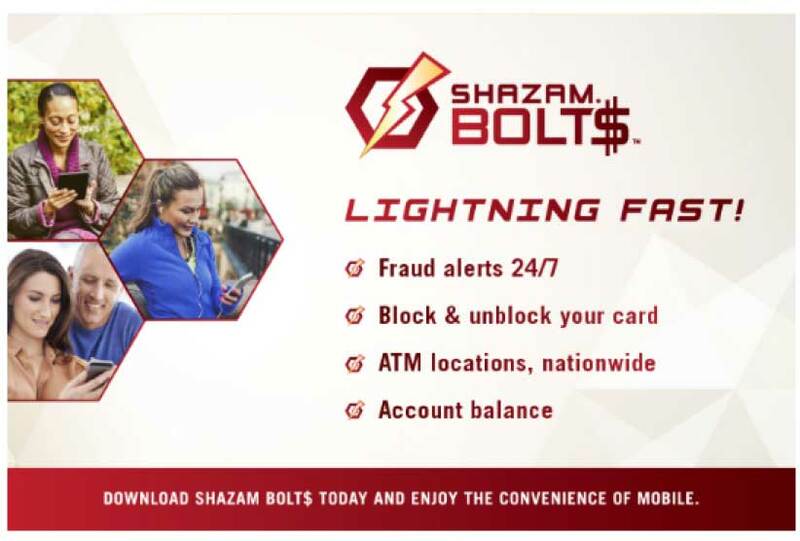 With the Shazam Bolt$ mobile app you’ll enjoy the convenience of mobile and the flexibility to manage your accounts wherever the road takes you. The app is enhanced with an ATM location feature and can provide fraud protection for your piece of mind; you can receive fraud alerts and check your account balance anywhere, anytime. The Shazam Bolt$ app also has a new Transaction Control feature you can use to temporarily block and unblock your debit card. Download Shazam Bolt$ mobile app today on the Apple App Store or Google Play. Century Bank, 116 S. Blossom St.
Shenandoah HyVee, 500 S. Fremont St.
Pella Corporation, 1500 S. Fremont St.
Century Bank customers may also use any “Privileged Status” ATMs surcharge free. “Privileged Status” is a network of community bank ATMs providing customers with a broad base of surcharge-free ATM locations. Look for the Privileged Status logo shown below.